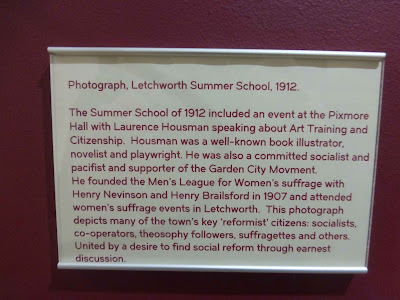 There's a new exhibition in the Broadway Gallery, Letchworth Garden City, Herts, called 'Alternative Letchworth', concerning the radical, left-leaning, new agey, 'cranky' origins of the town (which was when founded in 1903 the world's first garden city). Socialism, vegetarianism, mildly whacky religions, 'rational dress', women's suffrage and other philosophies all feature strongly. One thing that particularly caught my eye is this transcript of the tribunal, a century ago, of a conscientious objector on March 17 1916 (just as the Military Service Act, which conscripted most single men aged between 18 and 41 into the armed services, was coming into force). 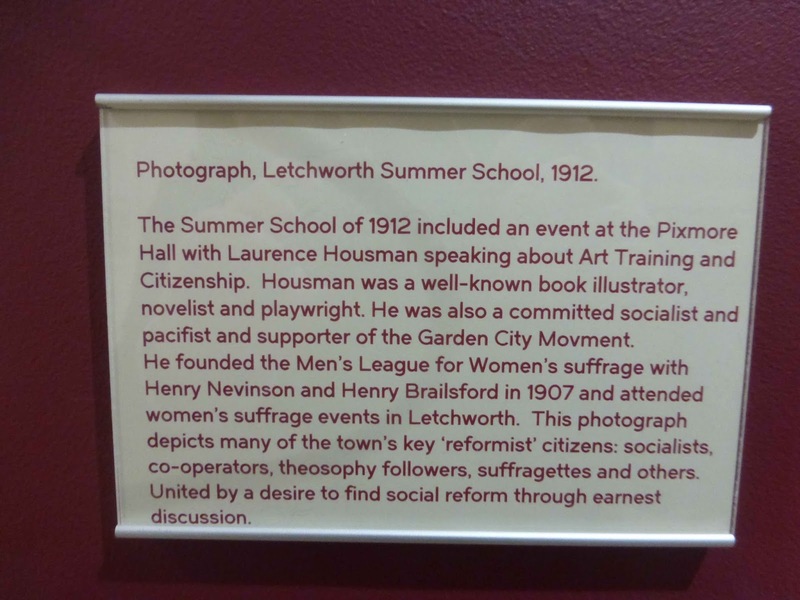 It took place in Hitchin, presumably because Letchworth was at the time too small to stage such events, with the patriotically monickered English Harrison* in the chair. The applicant also had a splendidly appropriate name, Ernest Judge. Surely someone called Ernest Judge is a near dead cert to win any court case he's involved in. The Mr Hine who sat on the tribunal board, contributing some sardonic comments, was almost certainly Neville Hine, the father of Reginald Hine, the historian of Hitchin. I'm not going to transcribe the whole of the transcript; you can read it yourself from the photos without too much difficulty (zoom in if necessary). I shall pick out some of the most lively and revealing exchanges. Judge, a Letchworth jobbing gardener aged 33, was allowed to make a fairly lengthy opening statement without interruption in which he adopted an uncompromisingly Communistic stance. War is absolutely opposed to the interests of my class - the working class. Wars are made solely in the interests of the governing class. These people make shells and so on. As a worker I belong to that section which believes in the principles of the International. I recognise no distinction of race or colour, and believe in the brotherhood of humanity. I imagine that the members of the board were very impatient as they listened to what they no doubt considered to be abominable bolshevism, (the typist failed to record any harrumphing), but they didn't question him on his political beliefs (probably having decided that they didn't want to get caught up in a debate), and to their credit they didn't allow their presumed distaste for his views to colour their eventual judgement. Judge went on to claim that the principle of compulsion is all wrong. Conscience alone to my mind is the deciding factor what a man should do. His third and final point was that I hold to the principle of the absolute sanctity of Life**, not merely human life. I would not take the life of an animal; it is therefore impossible for me to assist in taking the life of a human being. Hine, sensing a possible weakness in Judge's argument, asked him if he was a vegetarian. This was a rather barbed question, as in 1916 vegetarianism was scarcely more respectable than Communism, so if Judge said yes he was admitting to being, in the eyes of the board, at best a crank and at worst a dangerous idiot, but if he said no he would have contradicted his professed belief in the sanctity of all life. However, he had already implicitly 'admitted' to being a Communist. We can imagine Hine's slight deflation as Judge replied Yes, sir. Harrison asked Judge about his membership of a religious body, to which Judge replied guardedly; he seemed reluctant to say that he wasn't a regular member of any congregation, but Harrison let the point go. Hine, perhaps smarting from his minor defeat in the exchange over vegetarianism, went back on the attack (even though doing so meant going off the point: the tribunal was about the rights and wrongs of killing humans, not animals). Mr. Hine: You are a gardener. I suppose you would kill a caterpillar? [Judge:] I would not kill a caterpillar. Mr. Hine: I would rather save my vegetables. The Chairman: Would you take the life of an insect? Mr. Armstrong: You use a spade I suppose. What about the worms? [Judge:] I would not intentionally kill a worm. Mr. Hine: If you had a flea in your bed would you kill that? [Judge:] I would hesitate in taking the life of a flea. This statement prompted laughter in the room, to which Judge gave a dignified response. Throughout the hearing he rebuffed their attempts to browbeat him. Harrison changed tack and asked about Judge's education; (again, it's hard to see the relevance of this line of questioning; would they have been less likely to grant him an exemption from serving in the armed forces if he'd received a high status education?) Judge claimed that Tolstoi and Jesus were a greater influence on his outlook than his schooling. [Harrison:] You don't consider your scholastic education important? [Judge:] I had to unlearn most of what I learnt at school. This statement reveals an admirable independence of thought; I imagine that much of the schooling of children of Judge's class in the 1880s and 90s was designed to teach them their 'place'. Judge's comment provoked a sarcastic rejoinder from Harrison: You didn't unlearn reading and writing, I hope. 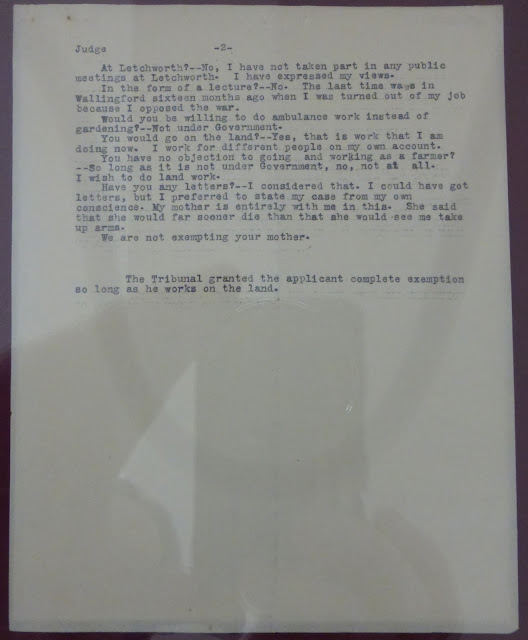 Next Harrison tried a more logical line of attack by trying to ascertain that Judge had held his pacifist views for some time, and that he was not simply conveniently and temporarily adopting them for the purpose of getting out of the war. 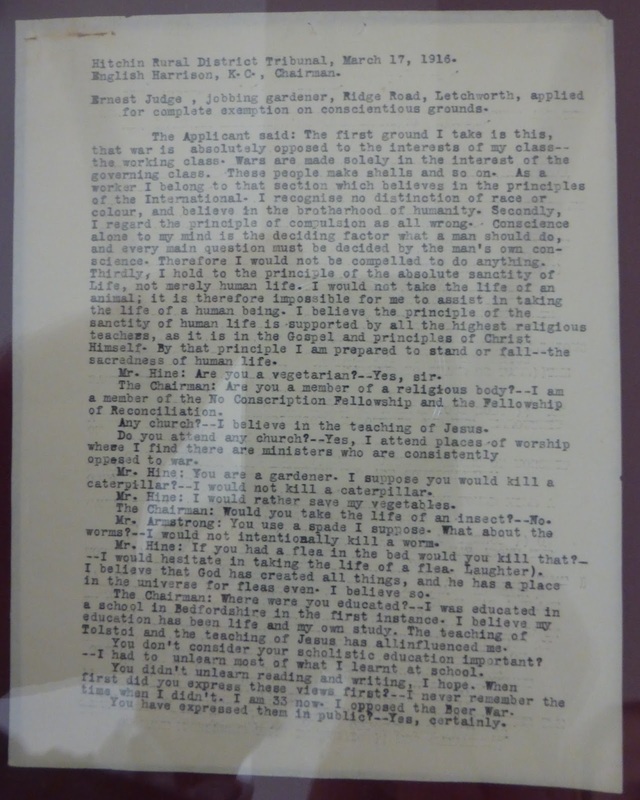 During the course of this Judge claimed that he was sacked from his job in Wallingford, Berks***, in November 1914 because he was opposed to the war, which is likely to make us sympathise with him as he had suffered for his beliefs. He was asked if he'd undertake ambulance work. He replied, Not under Government; from the context it's clear that he wasn't referring to the current Liberal Government, but that he meant he wouldn't do so if it meant taking orders from anyone. He expressed a willingness to work as a farmer, So long as it is not under Government. The tribunal ended on a sour note when he stated that his mother said that she would far sooner die than that she would see me take up arms, and Harrison responded We are not exempting your mother. After this, the final sentence comes as a surprise: The Tribunal granted the applicant complete exemption so long as he works on the land. Despite the board's scepticism about Judge's views, (even I, though I'm on his side, can see that he's idealistic to the point of naivety), they evidently believed him to be sincere and not a shirker (and, after all, farm workers were still vital). Presumably they could quite easily have rejected his application and sent him off to fight or to prison; I salute Harrison, Hine and Armstrong's fair-mindedness. I've heard it said (but can't currently verify) that Letchworth had the highest percentage of conscientious objectors of anywhere in the country, but also the highest percentage of volunteers to fight. If this is true, the radical nature of many of the early inhabitants explains the first statistic, but it's harder to account for the second. A couple of years ago my son did some archival work in Letchworth museum, and one of his jobs involved going through the local conscientious objectors' tribunals' records; he said that it struck him how humanely the applicants had been dealt with, on the whole (though I don't think they were all exempted). There were about 16,000 conscientious objectors in Britain in the First World War. Not all of them were treated as well as Ernest Judge. Over one third of them went to prison at least once for their refusal to serve in the armed forces, (some were inside multiple times), and often suffered brutal treatment there. Even those who were given exemptions were often vilified and scorned by their communities; we know that Judge had already been sacked from one job, but we don't know how he fared later. I doubt that his life was sweetness and light for the rest of the war, and there could well have been bitterness against him even after it ended. His suffering is scarcely comparable to that of the men in the trenches, but in all likelihood he suffered too. Just one more object from the exhibition: this is a photograph of the Letchworth Summer School, 1912, at the Pixmore Hall (the building is now an infants' school). High-minded individuals met for self-improvement and to change the world. 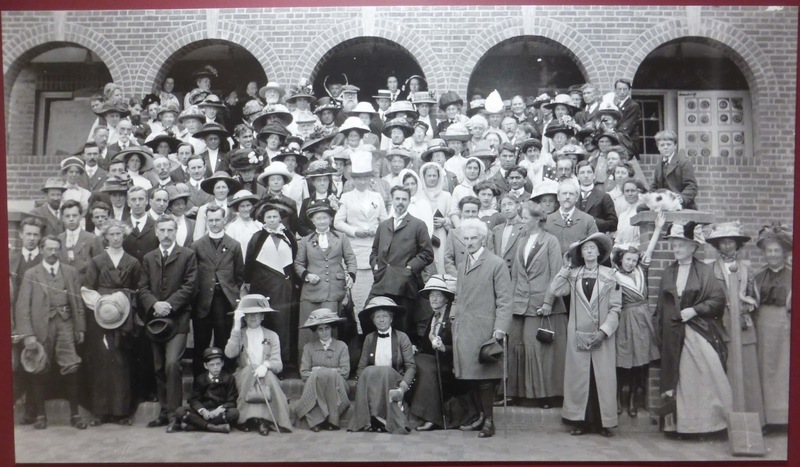 It's evocative of Edwardian life; you couldn't tell from their clothes that they're radical thinkers (except perhaps by noticing that some of the women on the right are hatless). 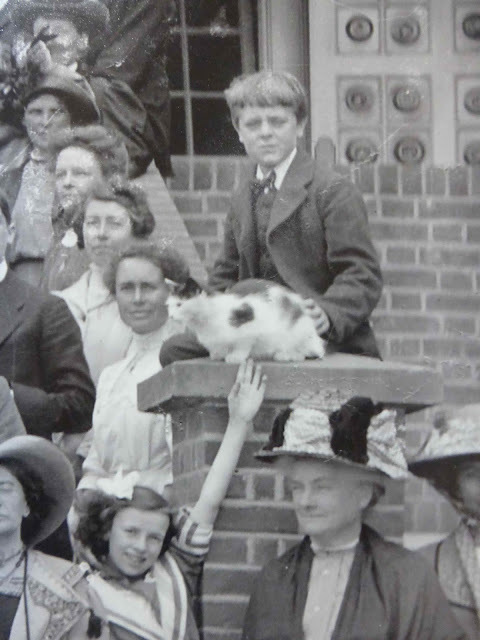 I'm always a sucker for cats in old photographs, (see here, for example), and there's one sitting on a pillar, being stroked by a very serious looking boy. A girl stretches her arm up and beams at the camera, the only smile among a glower of earnest faces. * His Christian name was William; English was probably his mother's maiden name which he used as a kind of double-barrel to make himself seem more gentrified. ** It's interesting to note that the typist capitalised the word 'life', perhaps showing a sympathy with his pantheistic views.